Teaching is a skill that can be learned. This is Fior Fest, an event where numerous instructors and students interested in Fiore taught classes. The last article I wrote was on communicating as a skill and one that can be learned and practiced. This article deals with the concept of flexibility in teaching. As a teacher at a public school things often do not go as they should. Want to show a you-tube clip that worked yesterday? Nope, filters have changed without notice. Want to get right into the day’s lesson? Nope, students are coming in late from the office or not showing up at all. Want to play a simulation? Nope, the class maturity is too low so they won’t learn from it. Time and again the best laid plans are thwarted, often for reasons beyond your control. Monitor and adjust. It is a phrase learned early in education and used frequently. The idea behind monitor and adjust is to realize that things many not work and yet the show must go on. If that you-tube link doesn’t work, see if you can download it, or skip it entirely and tell an anecdote that relates to the lesson. Like communicating, the ability to monitor and adjust is a skill that can be learned. In relation to HEMA you need to consider all the things that can go wrong. Attendance at a HEMA school/club can be spotty at best. Who shows up on a given day can be seemingly random. At my own club I have a core of regulars, but a revolving door of newcomers and casual visitors. This means planning can be quite tricky. Every session I need to monitor and adjust. One week I may have a group of people interested in rapier, but the next week they may not show up. To handle this, I have several introduction lessons ready to go. I have a two hour ‘What is HEMA’ lesson that uses the art of Fiore de Liberi to teach new students a smattering of all HEMA has to offer through wrestling, dagger, and the sword. This teaser class is one that I have one of my students assist me with and as they grow more comfortable I will leave them to teach it. I also have the same for rapier and saber and longsword, the three primary weapons of the Phoenix Society of Historical Swordsmanship. This means that anyone new to the club or a particular weapon system I can handle and I can also have a student teach part of it, which helps them better understand the material as well. The key to this method is having students who are regular enough to be promoted into the role of teacher. Teaching is not everyone’s passion, but for students it is a great way to learn and the more they do it, the more they own the material being taught. Another method to handling what to teach when your audience varies is to have a posted schedule. You can take the guesswork out by simply declaring Monday is sword and buckler day and Thursday is rapier day and so forth. This method will work best if you have a fee structure that is monthly. In this way the students are paying customers for the month and if they miss a day, that’s on them and it’s their money. I know of a school in Canada that does this and to further incentivize showing up the regulars are allowed access to elite training nights. My own club has a different fee structure of quarterly or per session, with most choosing the latter and so for me having a collection of ready-to-go lessons is the better method. 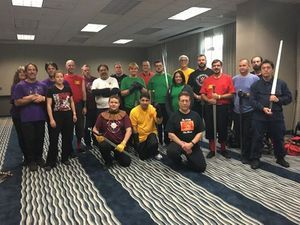 A mixed class is when there are both those who are experienced in HEMA and those who are new to it. This can be challenging because a basic class will not meet the needs of the veteran students. One solution, as noted before, is to have the veteran students teach. This can be done through assisting in the instruction of an intro class, or if they are ready, they can run the intro class, or, they can do other things. 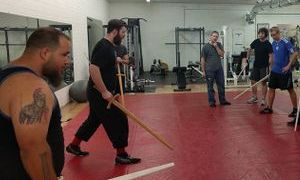 I often involve myself with the newer students in an effort to hook them to HEMA and am assisted by a veteran student. If I have a large number of veterans I will have another instructor or student take them to do other things. 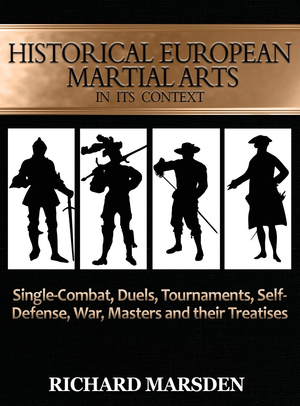 They include, sparring, advanced classes on techniques, or drills of a certain concept. This means I need to have a plan at hand about what to do with the veterans just like I do for the newcomers. Astute readers by now have noticed that the way I monitor and adjust relies on my more experienced students and fellow instructors. John Patterson and I have a large club so we can get away with this, but it was not always so. When there was just a handful of us in a park the issues were different. The student population was not large nor did it vary much. Classes tended to progress in a logical pattern. We’ll be doing longsword for the next month or two! This worked because the same crew showed up time and again. As your club or school grows in size you will not be able to do that- at least not without some planning and posting. The more people you have the more likely you will have dedicated students, but also casual ones and if you are doing well, a steady stream of new people as well. For the smaller clubs this is the time to prepare for the future by allowing your better students to teach. A club reliant on one person can only grow to the size of that person’s ability. A club that has numerous instructors and senior students has the capacity to serve a much larger and fluid audience. Space is the other issue. My club has enough space that we can divide into two or three sub-groups, each led by an instructor or student. If you are in a small space that also means you likely have a small student base and they are hopefully steadier in their appearance. As with student size, it is best to plan ahead for the size of where you teach. Parks have lots of room, but as you grow larger you are bound to draw the unwanted attention of the park officials. Most do not want you conducting any business in the parks. Small and casual groups are fine, but once you are in uniforms or collecting cash- expect problems! Gyms, dojos, dance-halls, and other venues should be something you and your students are on the lookout for. Your classes will have to adjust to fit your space just as you need to adjust to fit your student size. So, start preparing your veteran students early to help your club as it grows and keep an eye out for where you will go should you grow! To monitor and adjust is something that can be practiced. Adversity is the mother of invention as they say. Did not enough people show up today? Try teaching a difficult concept to the smaller audience. Did too many people show up? Split up into groups and trust your fellow instructors or senior students to handle some of the workload. Not enough swords? Place people into teams of three, two perform and one watches, then that person steps in at a given signal. Every challenge can be met and once you meet it once, you are more prepared the next time. This is an ongoing process. I have years of experience, but even I get surprised at times. I walked into the gym just before start-time to find around twenty fresh-faced college kids and their parents along with my regulars and a gaggle of new people. Oh yeah, I did agree to twenty kids coming in that day, but it had slipped my mind. Thanks to being ready to go with a newcomer two hour lesson and having experienced students and instructors on hand- we monitored and adjusted accordingly. The day went well! After I had run 2/3 of the intro class being assisted by a student, I then asked if the student could handle the rest of class on his own. Here, he teaches new people while I watch. He learns as well because he has to be able to answer their questions. Any errors he makes I either quietly correct or discuss after. It's just one day, no one is going to get ruined!